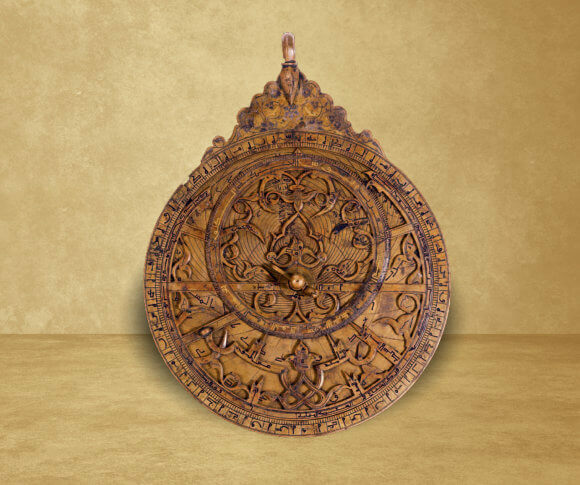 "Astrolabe is a term of Greek origin and considered one of the principal astronomical instruments made and developed by Moslems. 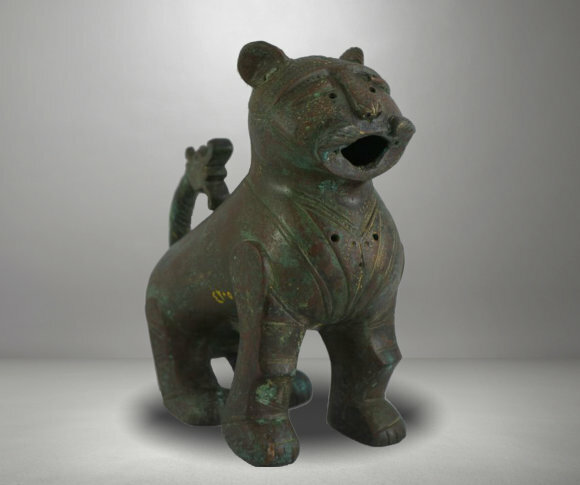 The Arabs used it to measure the ascendance of the planets and stars, their inclination, as well as in tracking their appearance and disappearance. They also used it in their geographical and topographical calculations, like in locating the cardinal points, guiding them during sailing, and determining prayer times. The Astrolabe is usually made of bronze or brass. It consists of a main disk called the mater (mother) which is the main part to which all the other parts are connected. It is connecting between the sheets and the rete (spider). Movable alidade attached to the back of the astrolabe. The astrolabe is hanging during its working for measuring the height and observation by using its hoop which is connected to the body by the handle and the base. 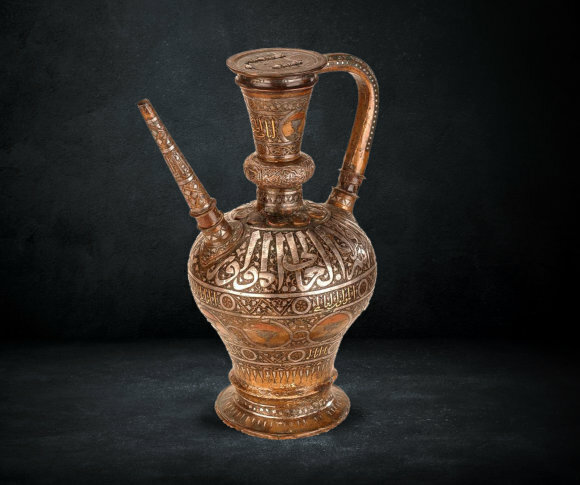 "This ewer was unearthed in Abu Sīr al-Malaq near Fayyūm, and some believe that it is attributed to Marwān ibn Muḥammad, the last Umayyad caliph, as it was found near the place where he was buried. It was probably used for washing and ablution purposes. It is famous for its spout which has the form of a shouting cockerel spreading its wings. it is probably a symbol of light which refers either to the Zoroastrian religion of the Sasanids or the Fajr prayer of the Moslem faith. It has a round body, a long neck, and a handle. The ewer is decorated with scenes of crescents, stars, and the sun disk which reflect the Moslems’ advanced knowledge in Astronomy. 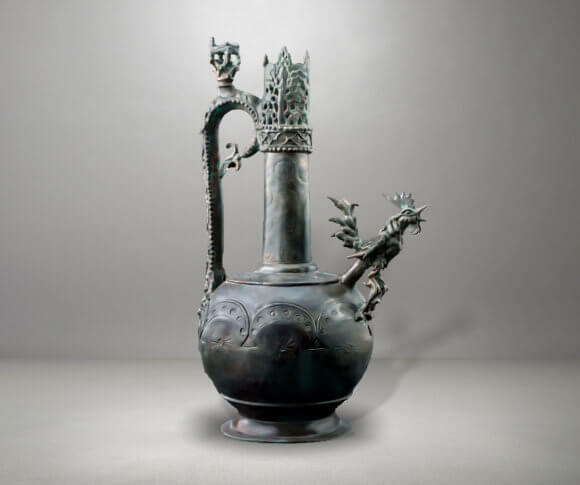 This ewer is considered a world famous incomparable masterpiece because of its marked artistic and historical value. "This kind of table was commonly called a dinner chair by some scholars of Islamic Art, whereas it was most probably used as a Quran holder in the mosques or for carrying the candlesticks during prayer time on both sides of the Miḥrāb. 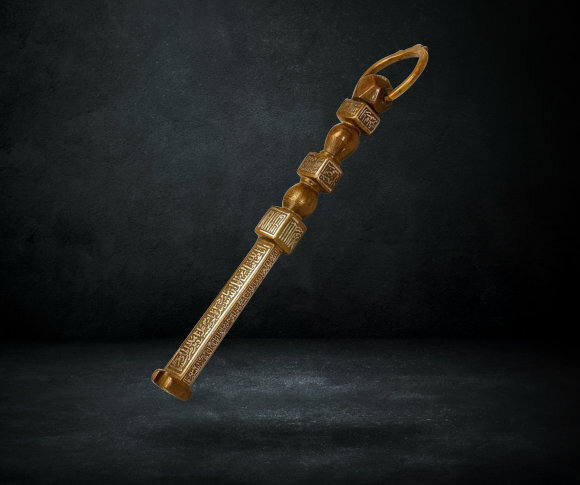 It could have also been used for holding personal accessories. The table takes the shape of a hexagonal prism decorated with vegetal, geometric, animal, and epigraphic motifs quoting Quranic and invocational phrases. A small double-leafed door opens up on one of its sides and is decorated with vegetal elements. 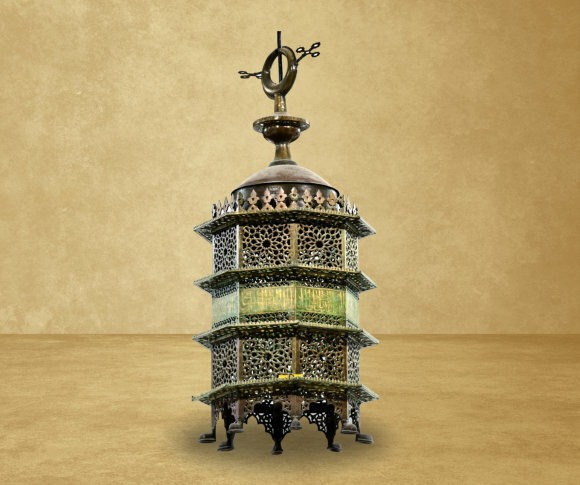 The legs of the table are connected with six supports bearing the name of the artisan who made it “Muḥammad ibn Sunqur al Bughdādi al Sankari and the date of manufacturing 728 AH/327-1328 AD. The inscriptions on the table refer to the name of the mamluk sultan al-Nāṣir Muḥammad ibn Qalāwūn who reigned Egypt for three periods; the last one was from 709-741AD/1309-1340AD. "Prince Ṭabṭaq was one of the men of the mamluk sultan Ša‘bān II 764-777AH/1363-1367AD. This ewer has been decorated with writings in Thuluth script depicting the name and titles of the prince and say: “ Made for His Majesty, al-Ašraf, the high ranked, the lord, the master of the worlds, the just, the invader, the fighter, the frontier fighter, the royal, the well served, the master of the sword, Tabtaq al-Malaki al-Ašrafī” The ewer also bears the blazon (rank) referring to his post as a water bearer (Ṣāqī) of the sultan. The ewer was discovered in the excavations of Qῡs in Upper Egypt. "Prince Ṭabṭaq was one of the men of the mamluk sultan Ša‘bān II 764-777AH/1363-1367AD. 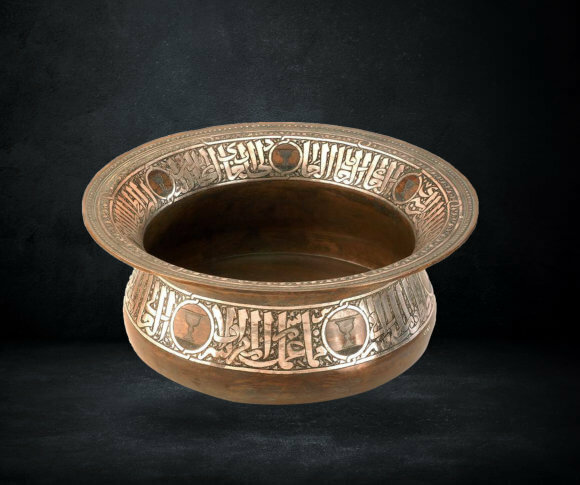 This ewer has been decorated with writings in Thuluth script depicting the name and titles of the prince and say. “ Made for his majesty, al-Ašraf, the high ranked, the lord, the master of the worlds, the just, the invader, the fighter, the frontier fighter, the royal, the well served, the master of the sword, Tabtaq al-Malaki al-Ašrafī”. The basin also bears the blazon (rank) referring to his post as a water bearer (Ṣāqī) of the sultan. The basin was discovered in the excavations of Qῡs in Upper Egypt. 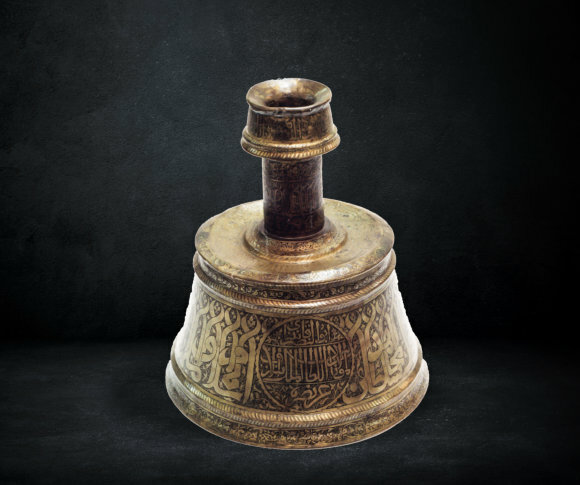 "This candlestick bears inscriptions referring to the mamluk sultan Qāytbāy 872-901AH/1467-1495AD, and was made for the holy shrine of the prophet Muḥammad (pbuh) in Medina. It is one of those candlesticks characterized by a tapering cylindrical base, a long neck and a conical candle groove. The body and neck are decorated with an epigraphic band mentioning the name and titles of sultan Qāytbāy. It should be noticed that the first letters of the words take the shape of rising criss-crossing flames, providing them with a sense of livelihood and mobility. Groups of epigraphic blazons of sultan Qāytbāy intermingle with the text. 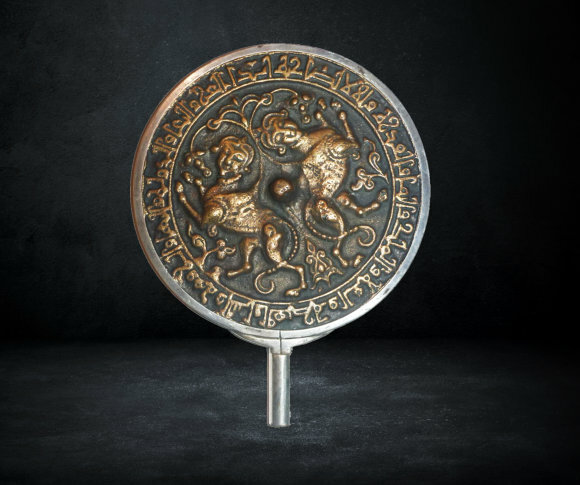 The central disk in the body bears an inscription which says :“this was endowed to the holly shrine by our lord, the sultan al-Malik al-Ashraf Abul-Nasr Qāytbāy in the year 880AH in the holy month of Ramadan”.
" 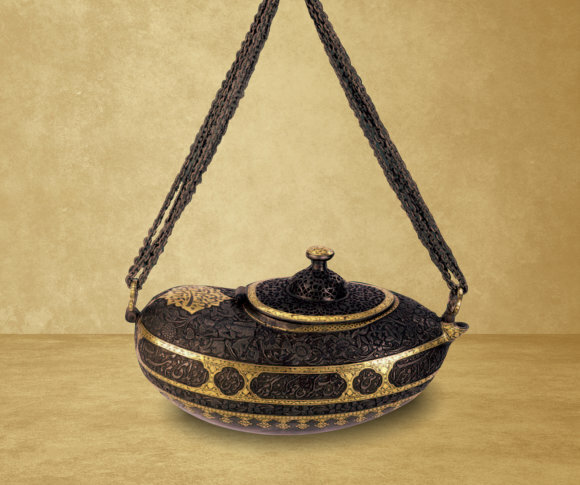 In the mamluk period, incense burners were popularly used in the mosques and houses. Their purpose was to spread the wonderful smell of incense throughout the place. Thus they were made of pierced metal in order to optimally serve their purpose. 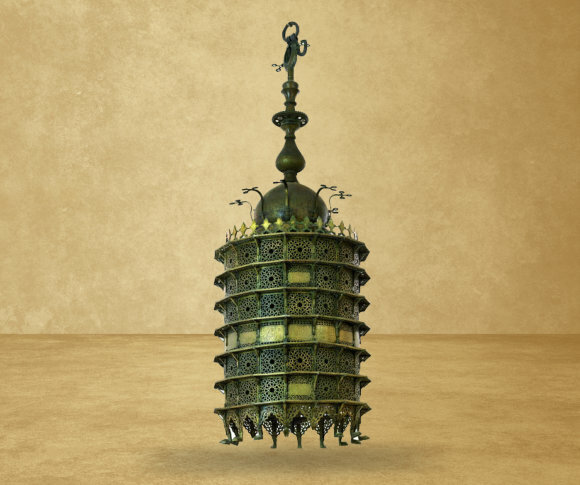 After the smell of incense permeates the entire place, a general sense of tranquility and happiness prevails, and the place becomes sanctified and fit for pious worshipping. This specimen is typical of its kind, consisting of a cylindrical body resting on three legs. 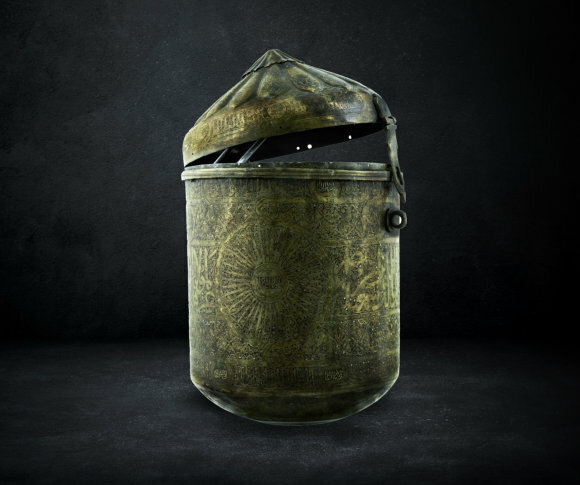 It has a pierced lid fixed on top of the body. 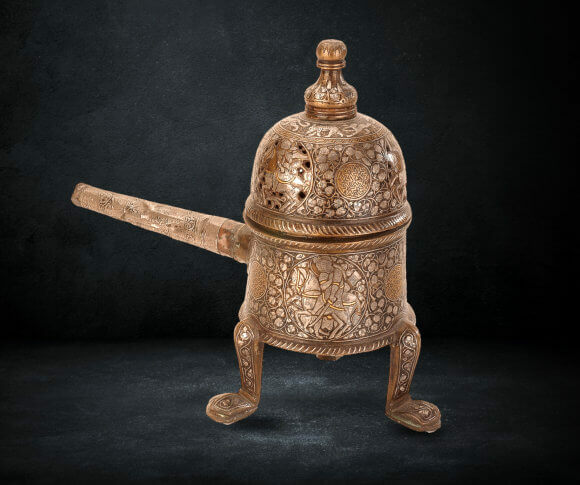 Mamluk Incense burners are characterized by the meticulousness of their craftsmanship and the versatility of their decorations which exhibit vegetal, animal and scriptural elements including both Quranic and supplicational phrases. "This cylindrical box with conical lid, has its body decorated with various vegetal elements and an epigraphic band of Naskh script referring to the mamluk sultan al-Nāṣir Muḥammad ibn Qalāwūn who ruled over Egypt three periods, and the last period was in 709-741AH/1309-1340AD. The base has an oval shape causing it to be unstable. Therefore, most probably it used to have its own holder or was put in another container. It is worthy mentioning that the pilgrimage ritual contributed in creating a good linkage and correlation between all the people of the Muslim world that creates a cultural feedback in the arts and spiritual culture of the Islamic civilization.